Portsmouth came from behind to win at in-form Northampton and close within one point of the automatic promotion places in League Two. Defender Ryan Cresswell had headed the hosts ahead with a thumping effort from Joel Byron's corner. Gareth Evans had Pompey level before half-time when he headed in Marc McNulty's cross on 32 minutes. 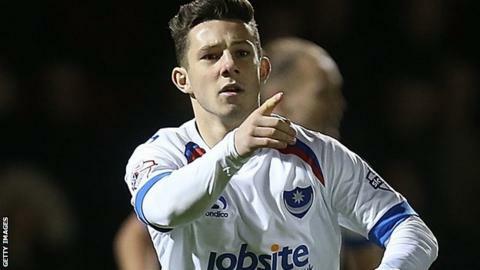 Substitute Conor Chaplin proved Portsmouth's match-winner as he finished Ben Tollitt's initial shot. "It was a tough one for us, we wanted to take the game to Portsmouth, but they have great quality. "The windy conditions allowed them to play higher up the pitch, but it's a scandal that they managed to score from our corner. "As I said before the game, anyone who finishes above Portsmouth will go up this season; and that's no spin." "I think when you win they're always big results. We've come to Northampton, a very good team. It's been a good game today. "I thought we got on the ascendancy the second half. "They certainly posed a threat throughout the game but to get the result and get the goals and see the belief coming through the lads, especially when we went 1-0 down, was fantastic." Match ends, Northampton Town 1, Portsmouth 2. Second Half ends, Northampton Town 1, Portsmouth 2. Adam McGurk (Portsmouth) is shown the yellow card for a bad foul. Substitution, Northampton Town. Sam Hoskins replaces Zander Diamond. Dominic Calvert-Lewin (Northampton Town) hits the bar with a header from the centre of the box. Corner, Northampton Town. Conceded by Enda Stevens. Goal! Northampton Town 1, Portsmouth 2. Conor Chaplin (Portsmouth) right footed shot from very close range to the bottom right corner. Ryan Cresswell (Northampton Town) hits the bar with a header from very close range. Corner, Northampton Town. Conceded by Gareth Evans. Corner, Northampton Town. Conceded by Matthew Clarke. Substitution, Portsmouth. Adam McGurk replaces Marc McNulty. Attempt missed. John-Joe O'Toole (Northampton Town) header from very close range is too high. Corner, Northampton Town. Conceded by Michael Doyle. Attempt saved. Brendon Moloney (Northampton Town) left footed shot from outside the box is saved in the bottom left corner. Corner, Portsmouth. Conceded by Ryan Cresswell. Attempt missed. Gareth Evans (Portsmouth) right footed shot from the centre of the box is close, but misses to the left. Corner, Portsmouth. Conceded by John-Joe O'Toole. Attempt saved. Danny Hollands (Portsmouth) right footed shot from outside the box is saved in the bottom left corner. Corner, Portsmouth. Conceded by Brendon Moloney. Attempt saved. Caolan Lavery (Portsmouth) left footed shot from outside the box is saved in the bottom left corner. Substitution, Northampton Town. Dominic Calvert-Lewin replaces Nicky Adams. Michael Doyle (Portsmouth) wins a free kick on the right wing. Second Half begins Northampton Town 1, Portsmouth 1. First Half ends, Northampton Town 1, Portsmouth 1. Marc McNulty (Portsmouth) is shown the yellow card for a bad foul. Attempt saved. Marc McNulty (Portsmouth) header from the centre of the box is saved in the top left corner.